Today’s my birthday. I’m saying this not as a plea for attention, but rather a chance to reflect on some things. Catavino has grown a lot in the past three years. In a few more months, we can officially call Catavino three years old, an achievement I never expected we’d accomplish. 33 years ago today, I was brought into this world during a snowstorm in Chisago City, Minnesota. By some accounts, I was the furthest one could be from the European wine culture. Growing up, I had parents who were never wine geeks, though not tea totellers either. It really wasn’t until late into my college years that I started looking into wine beyond the 1.5L that cost 10$, allowing myself to look more sophisticated at college get togethers. My first real purchases of wine didn’t occur until I turned 24. Therefore, I would have to say that in my life, wine has held a pretty important significance for only the past nine years. Seems like a lot longer than it is, but hopefully, my passion will last for many more years. I say this as I head out for martinis tonight in downtown Barcelona. Here in Spain, cocktails are a rare entity, and with most of our money going to wine, we don’t have a liquor cabinet to make our own. Not that I mind. When I do finally sit with a good dry martini or Manhattan, it tastes all that much better; yet this is not why I’m typing. My intention is to talk about a couple of wines. This past month, these two wines have reminded me why I love wine so much. Often, I look at wine too closely and fail to really enjoy it for what it is. Wine is not supposed to do anything, yet wine inherently has the power to do many things. One of the most significant of which is to make you slow down, whereby relaxing your mind to enjoy the moment without analyzing it. I was once told that you know you have a true friend when you can both sit at a table without talking and feel completely comfortable in the silence. No need to use words, make gestures, or wonder aloud, but just sit and enjoy the silence. A great wine does this too. It allows you the pleasure of thinking, or not. In my opinion, these are two wines that we have tasted this month which deserve to be highlighted well ahead of our final report. Maybe Gabriella will add two of her favorites later on. 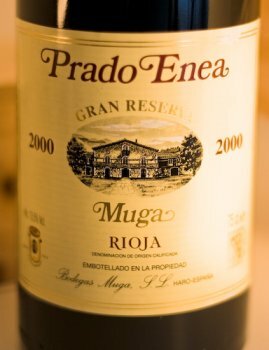 Bodegas Muga is synonymous with Rioja wine. Visit Haro and you cannot miss their tower raising up from the other side of the city. For me, they are also one of the first wineries I visited in Spain. Approximately three years ago, with almost no Spanish and a measly 5 euros in my pocket, I took the tour as a wine lover, not as a wine blogger. This time, Gabriella and I returned for a more extensive tour and a chance to taste a few more of the wines they had recently made available. Muga is a winery that walks the line of traditional vs modern with one leg on each side of the bar. Their award winning and ultra modern Torre Muga is a wine that needs taming, but if you can wait, it is also a wine that will reward you with pure fruit and surprising balance, albeit it in need of more than a day of decanting to show itself. But the Torre is not the wine that won my heart. Rather the Gran Reserva Prado Enea. Not a cheap wine, but a wine that is more than worth the money. Primarily composed of Tempranillo, with 20% dedicated to the other three traditional Rioja grapes, this is a wine that is both elegant, seductive, and close to perfection. Pale maroon in color, the nose on this wine shows sour cherry, rose hips, cardamom and delicate dusty wood. Though the softness and subtlety is so that every time I put my nose back in the glass I am rewarded with new flavors and a fresh perspective. I love wines like this, where I feel like I could spend a night just smelling the wine, without ever taking a sip. In the mouth this is a wine with impeccable acidity that is juicy and fresh with wafting spices that linger in my mouth. I don’t want to swallow and the softness of this wine makes it so that I don’t feel rushed as I enjoy the wines presence in my mouth. Fresh cherry flavors with myriad spices that are never oblivious, but rather seem to fade in and out, all wanting to share the stage in due time. I’ve had this wine with various foods and I will say if there is a better match than grilled suckling lamb chops I do not know what it is. If you feel you need to do anything beyond grilling them, I would suggest only the lightest of rosemary olive oils brushed on both sides, though that might be over doing it. 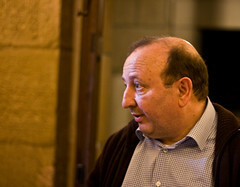 Moving on the second wine, which we tasted with the winemaker, Miguel Merino. Now I know that when you taste with a winemaker, you can feel pressured to say good things about their wines. I also know that a warm person and good hospitality can lead others to question your impartiality. Having visited and tasted many wines this past month with wine makers and importers I have to say, phooey! Gabriella and I have worked out a method of polite nodding and sidestepping that we hope is convincing and allows us to move on without kowtowing to the winery. On the flip side, sometimes you taste something that is so special that you begin to question your ability to be impartial. Such was the case with the2000 Miguel Merino Rioja Reserva. Initially, we expected a simple and good wine very similar to the wines we had tried before. None of the previous were bad, all very enjoyable, and therefore we anticipated some more of the same. However, as Mr. Merino placed two full glasses in front of us, we immediately noticed how the wine was something different. Nice deep color with a nose that is dusty with cinnamon, oak, marzipan, spice box and dill. I remember sticking my nose back into the glass again and again as the aromas evolved and seemed to morph again and again. With a little time it continued to evolve with cardamom, sweet cherry coming forward. The first sip of this wine and i knew we had a special treat, as light minerals mingled on the palate with fine tannins, that lead to cherry flavors that were both succulent and spicy. I was very happy and sad at the same time sad that we were soon to be moving on and would be leaving half a bottle untouched on the table before us. I know I spoke of both of these Rioja wines recently, but I do feel they both deserve some recognition beyond that brief mention. Sign up for our newsletter today, and you’ll be alerted when our full report comes out on Rioja ahead of everyone else, not to mention you’ll receive a special treat to go with it.